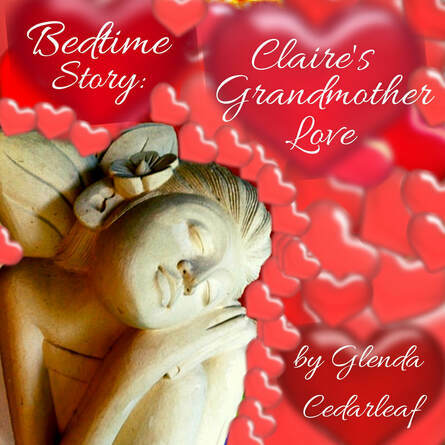 In this bedtime story, we will be exploring the depth of love between a grandmother and granddaughter, that fosters the compassionate and creative spirit. Claire spends a weekend away at her grandmother's house, away from the rigidity of everyday responsibilities, where she can be immersed into a magical, loving journey that includes, toys, tea parties, dolls, nature, songs, laughter and more. A wonderful mentor once advised me to remember to be a loving engaged grandmother to myself. This choice to be fully present with ourselves, nurturing connection and creativity is the best healing gift we can offer to the places within us that feel vulnerable, abandoned and lost. It is this journey of integrating the inner child and the inner wise one that brings deep healing . May this grandmother love encircle you with presence and serve as a Valentine blessing for you!